HÀ NỘI – Becamex Bình Dương won their second match under acting coach Nguyễn Thanh Sơn yesterday, beating Viettel 1-0 in the late match of the V.League 1’s fourth round. Bình Dương were predicted to fall into trouble after head coach Trần Minh Chiến resigned last week, after just three rounds of the league season and four day before they began their AFC Cup campaign. Sơn has managed to unite his players and give the team a breath of fresh air after Chiến’s resignation over disagreements with his players. Though they had home advantage against Viettel, Bình Dương almost conceded in the first two minutes, but Gustavo Santos’s finish was ruled out for offside. 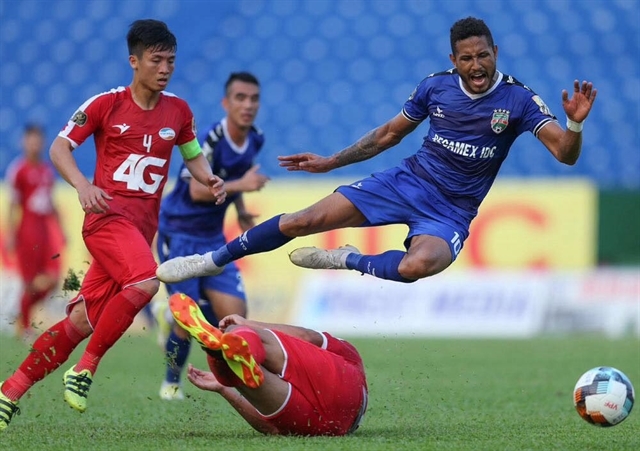 Viettel played without national team captain Quế Ngọc Hải who has been banned due to dangerous play in the Hà Nội derby, but managed to create plenty of problems, with Vũ Minh Tuấn and Santos threatening Đức Cường’s goal several times. On the host’s side, efforts by Lê Tấn Tài and Wander Luiz were denied. It took till the 67th mark for Wander Luiz to open the scoring, running from Viettel’s defenders to loop the ball over goalie Thế Tài. The visitors threw everything at Bình Dương in search of an equaliser, but were unable to find the leveller. “Bình Dương were in trouble and headlines when coach Chiến left. We were all surprised with his decision but as pro players we must work well in all conditions,” said former national midfielder Tài. The deputy captain added that Bình Dương would have a busy schedule in both the V.League 1 and AFC Cup over the next few weeks. Bình Dương’s first win pushed them to fourth in the table. They trail Hà Nội, HCM City and Hải Phòng. Meanwhile Viettel fall to twelfth with three points. They have only one point more than the two bottom teams, Quảng Nam and Thanh Hóa.